If you do SEO for the vast variety of niches, industries, and website designs more likely than not you come across plenty of ‘what ifs’ and ‘buts’. And then, if you are the curious type, you test to check whether your assumptions are correct. Well, we are definitely the ‘curious types’. And one of these ‘what ifs’ was whether ‘hidden content’ or the content displayed under ‘read more’, accordion sections and tabs could leverage the same results on SERP as visible and open content on the page. We have been noticing, along with other SEO specialists, that hidden content does not perform as well as visible content and does not deliver the same impact on rankings. But these were just our assumptions. We needed solid (or at least close) proof that our assumptions are correct. How do we get as solid proof as we can? Yes, you got it: the experiment. We have run an experiment over the course of three months to confirm our observations. Although for the most part the experiment was conducted both for our own reference and that of the clients that get stuck on their way to Top 5 and insist on keeping the content hidden, we thought that those of you who want to see that ‘solid’ proof will find our experiment quite interesting and turned our findings into a blog post. How Did We Organize Our ‘Hidden Content’ and ‘Rankings’ Experiment? To verify the assumption that SEO-optimized ‘hidden content’ displayed in accordions, tabs, ‘read more’ or ‘click-to-expand’ sections performs worse on search engines, is partially devalued and has less impact on rankings than the content visible immediately when the page is loaded. We have purchased 5 new and ‘clean’ domains with the same name extension. Before purchasing a domain we ensured that the domain had no previous history or backlinks. Unique content was written for each of the websites of approximately the same format and length. First, we introduced two websites. After 6 days we introduced the other 3 websites. We researched the impact of the hidden content both on homepages and the inner pages with various types of URL structures. 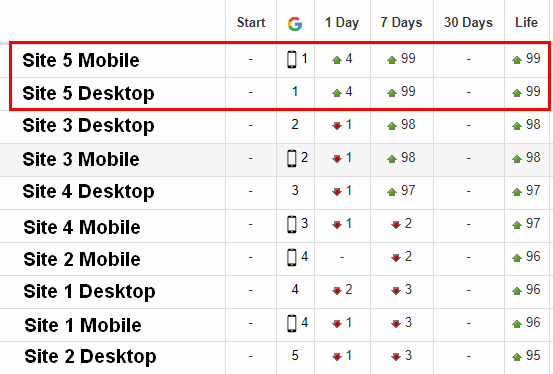 We tracked the rankings both for desktop and mobile versions of the website. Throughout the experiment, we took the effect of various onsite factors into consideration. The experiment was launched on the 20th of January 2019. The content was published on the homepage on both of the websites. Title tags did not contain the focus keyword (the unique random word we have invented for the purpose of the experiment). The length of the content was 598 and 599 characters respectively. Both texts had two h2 headings each containing the focus keyword. The focus keyword was used 4 times for each of the texts. The difference: the content on Site 1 was visible immediately, while the content on Site 2 was placed in the accordion section. Both websites were added to two different Google Search Console accounts and request for indexation was sent. 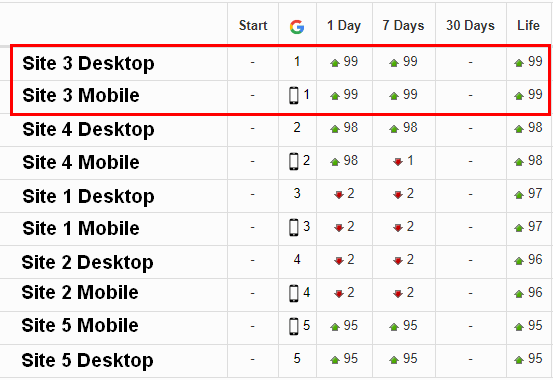 Despite the fact that Site 2 was indexed before Site 1, Site 1 (with visible content) ranked first both for desktop and for mobile. And this was just the beginning, the first stepping stone towards ‘proof’ of our theory. Because, although this serves as an initial confirmation of our assumption, it does not really prove anything, right? There could be other factors at play that could have an impact on rankings: after all, if there are only two sites with this keywords then one is bound to rank 1st making the other one 2nd. So we move on to the second stage. Site 3 had visible content (596 characters), the focus keyword both in the URL and the Title tag. Site 4 had hidden content (597 characters), focus keyword both in the URL and the Title tag. Site 5 had visible content (599 characters), and neither the URL nor the Title tag contained the focus keyword. Site 4 (with hidden content) ranked first for desktop and mobile. And that made sense since Site 4 had focus keyword both in the URL and the title tag. Now is the time to introduce Site 3 to our experiment, which just like Site 4 had focus keywords in the URL and the Title Tag, however, unlike Site 4, its content is fully visible. At the same time, we indexed Site 5 without the focus keyword in the URL/Title Tag to evaluate the impact of the focus keyword. 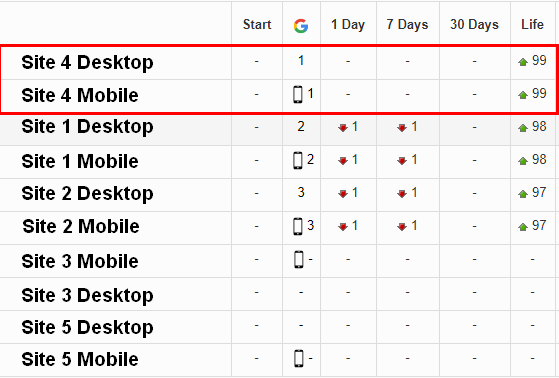 Exactly what we have expected: Site 3 (with visible content, focus keyword in URL/Title Tag) has immediately outranked almost identical Site 4 (identical to Site 3 but with hidden content) which was indexed first. And then we decided to test what is going to happen when we optimize Site 5 (which had no focus keyword neither in title tag no URL and ranked last). The Takeaway: Can Hidden Content Affect Your SEO? First place: Site 5 (focus keyword in the title tag, VISIBLE content). Second place: Site 3 (focus keyword in title tag/URL, VISIBLE content). Third place: Site 4 (focus keyword in the title tag/URL, HIDDEN content). Fourth place: Site 2 (mobile, no focus keyword, HIDDEN content). Fifth place: Site 1 (no focus keyword, VISIBLE content). Sixth place: Site 2 (desktop, no focus keyword, HIDDEN content). Our team just loves SEO experiments, so follow us on social media and stay tuned. Next Post Homepage Authority or What Percent of Links To Build For Your Homepage?